The Town of Steinhatchee was originally named "Stephensville" after James Howard Stephens, a local pioneer who founded a post office at the location in 1879. Even earlier in the 1800's, the area was known simply as "Deadman's Bay", and was explored by Andrew Jackson, and later by Zachary Taylor, during the Seminole Indian wars. In 1931 the town was named "Steinhatchee" after the river whose north bank it occupies. Its neighbor on the south side of the river is the Town of Jena. The name "Steinhatchee" is derived from the native American "esteen hatchee", meaning "river of man". Like many of the small coastal towns on the Nature Coast of Florida, Steinhatchee is a long desolate road away from civilization - in this case, 10 miles south on State Road 51 from where U.S. 19 runs through Tennille. The town was founded as a fishing village. But during the Civil War the area was instrumental in producing salt from sea water for the Confederate Army. Today, fishing is the major industry here ... both commercial and sport fishing. And from June through September, scallop harvesting is one of Steinhatchee's most popular activities - attracting scuba divers and snorkelers from all over the world. A rectangular grid of tree-lined streets nestled into a bend in the river, Steinhatchee prides itself for its "old Florida" charm. Highway 51 becomes Riverside Drive as it follows the river bank through the downtown area. A number of high-end eateries are located within easy walking distance of tourist accommodations in the area. Whether you prefer a simple hotel, a condo on the riverfront, a cozy cottage, or an AirBnB place - you'll find plenty to choose from here. In addition to sport fishing, the community draws tourists who like kayaking, hiking and bicycling. Located at the mouth of the Steinhatchee River, kayakers can explore the numerous channels along the Gulf salt flats. More ambitious kayakers may want to plan a day trip and paddle 7 miles upstream to Steinhatchee Falls in the Steinhatchee Springs Wildlife Management Area. Visitors who bring along their bikes will find the shady streets in the town provide a great way to get just about anywhere in Steinhatchee. And hikers will enjoy being surrounded by a number of conservation and wildlife management areas with trails to explore. 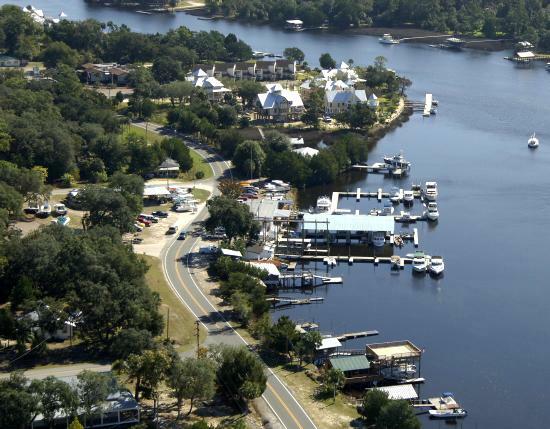 Each December, Steinhatchee celebrates the holidays with "Christmas in the Park" and a boat parade down the river. On Independence Day, the 10th Street bridge between Steinhatchee and Jena is closed to traffic, and the two communities enjoy a huge fireworks celebration. And if you visit in February, make sure to check the dates for the town's most popular annual event - the Fiddler Crab Festival.